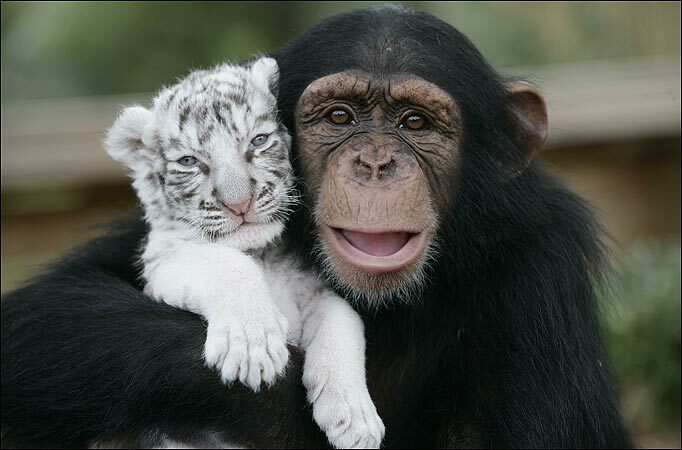 A chimp named Anajana has become a surrogate mother for 23 day old White Tiger cubs Mitra and Shiva at the Institute of Greatly Endangered and Rare Species (Or TIGER) in South Carolina. She helps out keeper China York in the caring and feeding of the cubs. The cubs had to be separated from their mother after she was spooked by hurricane Hannah and turned aggressive. Anajana has also acted as a surrogate for leopards, lions and orangutans as well as the baby white tigers. This is the effin cutest story ever. Check out the slideshow. « Baman/Piderman – Yes, you read that right!